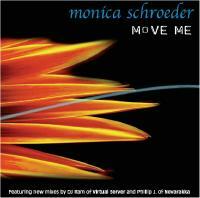 Originalzitat: ""Move Me" is a project that A Different Drum put together after hearing Monica's two albums, "Orbit" and "The Expectation of Home". Though those two albums are more in the acoustic arena, her voice is like honey, sounding like a great blend of Sarah McLachlan and the Cowboy Junkies. We felt that it would be exciting to hear a few of her songs from those albums mixed into an electronic club sound. Vocals were given to Nevarakka in Sweden and DJ Ram in Russia, and the results are fantastic!"